In this post, we examined some of the best-looking Ita-bags on the internet- and hand-picked some that you can buy online to create your own! If you’ve already got a lot of anime straps, charms, plushies, badges etc but still looking for the latest trend? If you say yes to any or both of these, an Ita-bag should be on the top of your next must-buy list. Because they are ‘weird’ or ‘painful’ to look at, in Japanese, it’s written 痛バッグ in Japanese, according to Manga.Tokyo: “痛 means ‘painful’ and バッグ means bag”. Though the trend isn’t a brand-new one and started receiving national news coverage in Japan in late 2015, today it has become extremely popular and high on demand all over the globe. 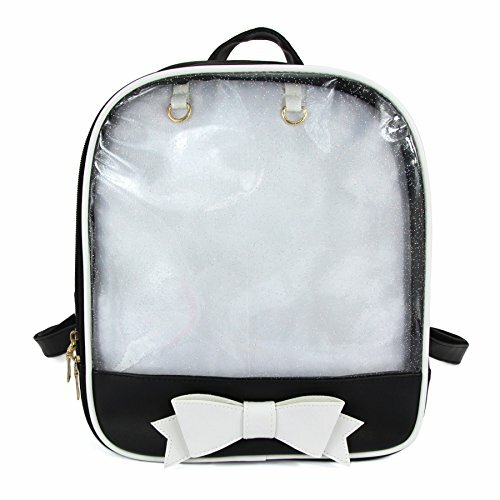 Dimensions: This kawaii bag dimensions is16"(L)x5.5"(W) x 10"(H) with interior 1 large main pocket and 1 zipper pocket,1 clear window pocket for pins, buttons, enamel, stickers and plush dolls or mochi mascots, perfect to show off your merch! Besides, has a big back zipper pocket to hold private stuff. Material: Made of premium PU and full density of nylon. All of the zippers work great and open smoothly. The stitching is very clean and sturdy. There has a bag bottom support the backplane. Bottom tacks were placed 4 protects against soiling. If you have recently been to Japan, you might have already seen people with Ita-bags covered in numerous badges. If this has inspired you to buy one for yourself, there are some simple things you should keep in mind when buying your Ita-bag. Location Appropriate? First of all, there is not any specific time when carrying an Ita-bag is appropriate and when it is not. So, this bag can serve you wherever you go. However, the majority of people carry them when they visit events, themed cafes to demonstrate their love for their favorite characters. It is important to note that an Ita-bag weighs several kilograms, so they can be hard on the shoulders. If you do not care about carrying the weight of love, you will do just fine. Layers? While purchasing, remember to ensure that your bag comes with an additional plastic layer that would not only prevent badges from getting caught on your clothes but would also help to prevent damage to the items. Pricing: On the price front, the goods themselves usually do not cost much, but when you attach a huge number of them to a bag, it may end up costing a significant amount of money. Piracy: Like movies, music etc, fan merchandises also come with the problem of piracy. There are a lot of pirated goods you can put in your bag these days, just to be sure to buy the official goods. If you get the merchandises from collaboration events, you can be sure that they are official. The name “Ita-bag” originates from a Japanese word that means “pain”. The main reason for calling this famous anime trend this name is that such a bag can become painfully heavy when you use it because of all the goods added to it. 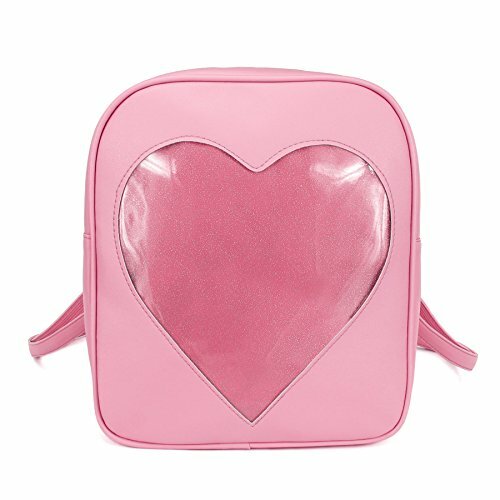 The reason behind the huge popularity of these bags is that they allow you to exhibit your love for anime and manga in a unique way. The idea of putting anime charms on various apparels dates back to the emergence of anime charms. However, purpose-made Ita-bags took the trend to a whole new level around 2015. In places outside Japan, these bags are sometimes called decoration bags or clear window bags. Put simply, an Ita-bag is a bag which no longer appears like a bag. Rather it is covered with keyrings, badges, and anything that is featuring the favorite character of the carrier. 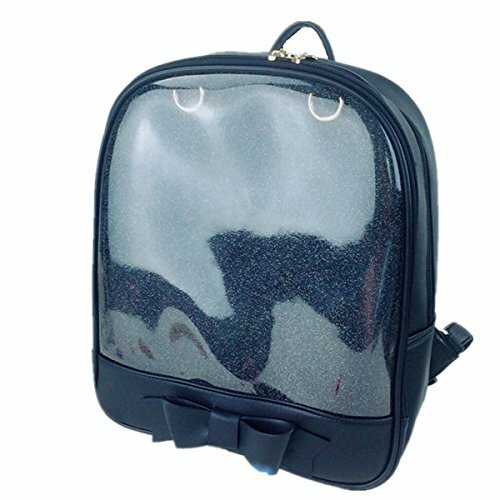 Usually, these bags are made out of bags that come with either an additional plastic coating on their outside to safeguard the goods from damage or a clear window. 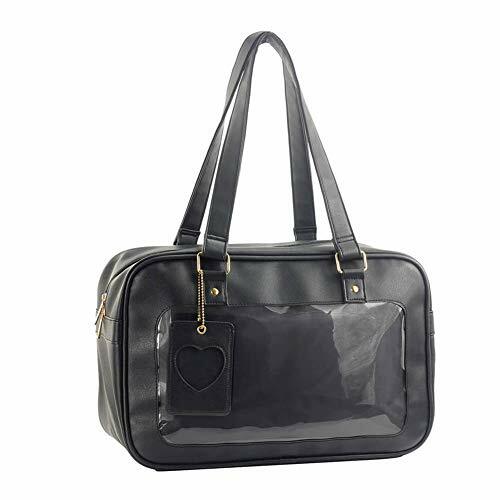 Here’s another gorgeous example- a black bag with a heart shaped window surrounded by diamond-looking stubs. It’s finished off with a fun yellow bow- very artisically done. There are also items called Ita-suitcases and Ita-trunks. They are just bigger versions of Ita-bags where you can attach pictures of your favorite characters, attach badges to them, and cover them with a transparent cover. If you want to protect the lining of your Ita-bag or just want a simple way to change out the pins, then having an insert is perhaps the best you can do. To create an Ita-bag insert you will need things like craft foam, tacky spray, and fabric of your choice. First, use your bag to trace the size and shape of the insert on the craft foam with a marker or pen. You may need to trim down your foam as you proceed. Once the template is good to go, cut it out. Then lay the template on the top of the fabric. Remember to leave a couple of inches extra on every edge. Next comes the time to glue. Make sure to do this on top of something you will not mind getting the glue on. Lay your fabric on top of the foam template. Now lift up half the fabric and start spraying the foam, placing the foam back down immediately, beginning at the center and smoothing it down until the edge is reached. Now, repeat the same steps for another half. Now, trim the additional fabric along the edge of your additional foam. Finally, place the pins and put it in your bag. If the process seems like a difficult one, you can watch this video to get a clear understanding. 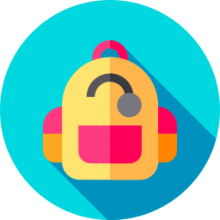 If you are a DIY enthusiast and looking to craft your very own Ita-bag, a proper Ita-bag base plays a highly crucial role in the success of your project. Tote bags are most commonly used to create these bags. Majority of these bags are square, so they can fit a very beautiful display window – sometimes one on each side. If you want to try out something more practical, messenger bags can be a good option. You can wear them on right, left, front, or back to let your message be heard. If you want to travel with your Ita-bag, an Ita-suitcase offering a huge display window is the thing you should go for. Finally, there are pencil versions that offer a body-width display window and ideal for a couple of well-placed charms. These bags have a covered a long way from the simple canvas tote bags which female anime fans used to cover with badges, pins, acrylic key chains etc. These are now bedecked with glowing LED lights that add a splash of color and brightness to the bag. Though it will take a significant amount of time and patience to make your own glowing bag, the end result will surely worth it. Alternatively, you can add string lights to your bag. These strips are available in multiple colors and can match to almost any Ita-bag’s color scheme. Just be sure that the batteries offer a good working life and are replaceable when you buy the string lights. 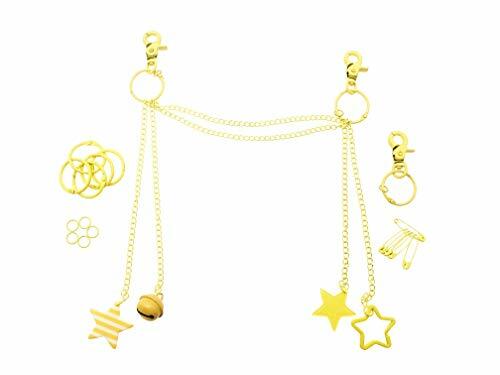 Package Content: 19inch chain*2, large loop*5, small loop*5, small bell*1, key ring*3, little star*3 and pin*5. Not ita bag included. There are lots of Ita-bag accessories available in the market that you can use to flaunt your love for your favorite character or series. From buttons, keychains to plushies, bromides, and more – you can show off the passion in a diverse range of ways. 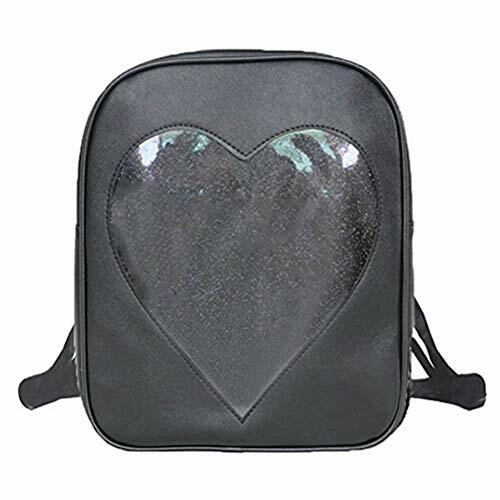 If you want your bag to be as bright as possible, you can look for rhinestone stickers to give your bag a good sparkle. Also, there are lots of decorative chains that come in various fancy styles and multiple colors to be used with an Ita-bag to enhance its style quotient. Decorating chains are particularly useful if you do not want to use a lot of safety pins. You can simply attach straps and charms straight to your chain itself. 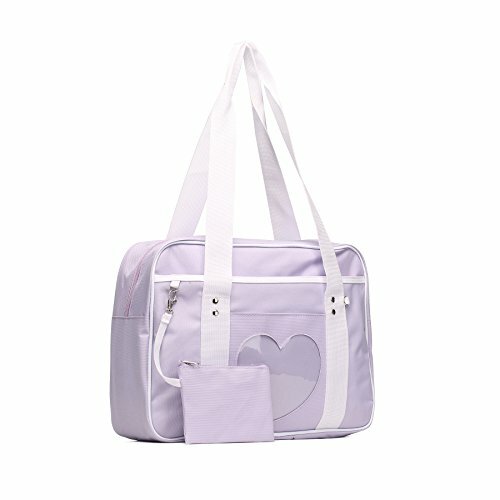 Though an Ita-bag can put a real strain on your shoulders, owners of this product agree that the pain is absolutely worth. If you are looking to make your own Ita-bag, here are the simple steps to accomplish it. First of all, choose a bag with enough surface area that can fit all your accessories, together with sturdy material to keep them secure and fixed. The straps and/or handles should also be as comfortable and sturdy on the shoulder(s) as possible. Once you have zeroed in on your bag style, it comes to decide on the color options. Try to match the base shade of the fabric to the character or series you are devoting the bag to. Now, it is time to do decorations. The simplest method to secure decoration is to pin those on. Proper arrangement plays a crucial role in this bag’s appearance. Try to keep a big accessory or badge as the main focus and then place smaller items around it. With all those accessories, these bags get heavy, even before you put your stuff inside. To get an idea about the weight, pick the bag often as you decorate to ensure you can still lift it. And once you are happy with the final weight and design, you are ready to display the world your very own Ita-bag. If you want to learn more thoroughly about the process, this video can help you out. It is natural to get overwhelmed by the availability of different types of colors used in Ita-bags. 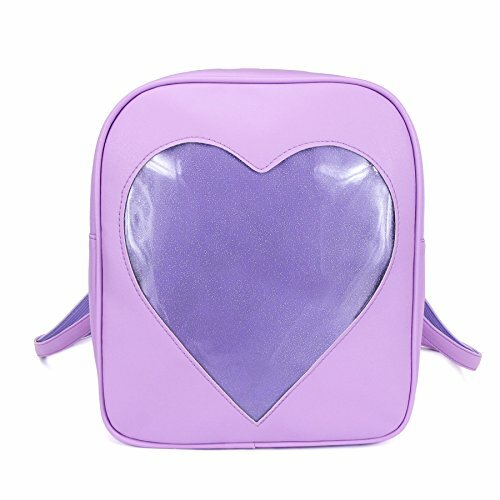 In that case, if you are taking the DIY route, you should use a bag whose color is similar to your favorite character that you are going to make your Ita-bag for. For example, if the personal color of the character is bright, say pink or orange, you can choose the opposite kinds of colors such as white or black. It will give your bag a sense of unity that makes the bag more attractive.